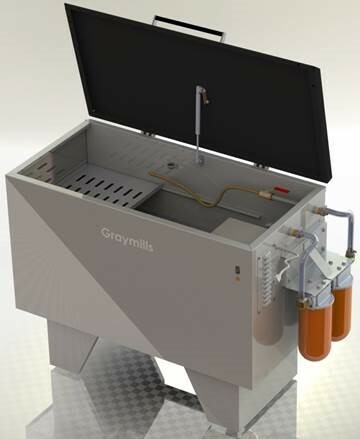 Graymills introduces the HP Indigo Edition Parts Washer, Part Number: A-44213-A. This product was created specifically to clean parts from the HP Indigo Digital Press. The parts cleaner was designed with input from HP Indigo experts to operate with HP Imaging Oil. The Graymills HP Indigo Edition parts cleaner leverages 80 years of Graymills experience in graphics and parts washing. Twin filtration via 8 and 3-micron filters in series to reduce the possibility of redepositing debris on parts while cleaning fluid.